Whoa you work fast! and really cool style… makes me want to work harder. Keep Going! hey man…the rigging looks fine…i like the controls that you created…and i can se that you are using vray renderer, am i right? Well, here is the next update for the exterior background, since i will be using a lot of compositing to avoid rendering the full frame i can put as much detail as I want so i am going crazy with the polycount in this one, anyways, it wont be too easy but i hope it will work fine. i still have to clean it quite a lot (since its really hard to me to animate!) but i will give my best shot on this. that is it for now, any critiques and comments are always welcome! nice background so far…work the lighting it needs more contrast, just a thought cant wait to see more. Here is the first sample of how the format for my short movie, the story will be told as an animated comic book showing diferent sketches of the character doing strange stuff, this thing is proving to be a huge challenge! so many effects, particle stuff, rigging, texturing lighting etc etc that it is almost overwhelming! I might have to cut the full story i wanted to tell because the 2 min animation rule, but those 2 minutes will be very very clean and carefully made… i know the animation is quite rough for now but i wll keep refining it in the coming weeks, but not until i have at least a rough versions for all the scenes done hehe. Good Luck with your entries! this is a test for some materials and stuff around the scene, and one of the shots that will be on the final version… i will be working in the modelling a little bit more to make it more stylized but at least i wanted to show you that i haven`t forgotten about this haha. good luck with all your entries! I like the animation, but in my opinion the animation part with the ballet tutu it’s not fine. the alligator seems be to move more slow. Wow, this is a fabulous entry! Great modelling and lighting, I especially like the environment! It will be great to see the finished piece! frankitu: hey, si es que animar personajes no, no es lo mio… de hecho esa parte del ballet va a quedar solamente como una serie de fotografias pegadas en un àlbum para contar la historia. haha, eventualmente podria animarlo pero seria un gran dolor de cuello. DrFx: thanks for your comment, I think Cunga (the character) looks a little strange on this enviroment because everything is too realistic… but i will try to change either the character or the enviroment hehe. dude that is looking sweet!..love the lighting and the elligator is so funny lol… grt8 update… will b waiting to see more updates soon… keep working mate!! anyways this might be quite a rush time, but i am sure it will be fun… so… read you on the next updates! well, i am going nuts with the speed here haha, too many things to do, this is the intro for the short, in the image below there is a sample of how the animation will look, since i dont have enought time to animate all the scenes, i will be telling the story trough still images, so the camera will be floating around this bamboo frames, and some of the images inside them will be animated, there are in total 16 takes accordingly to my schedule… so… let get working and less writing! 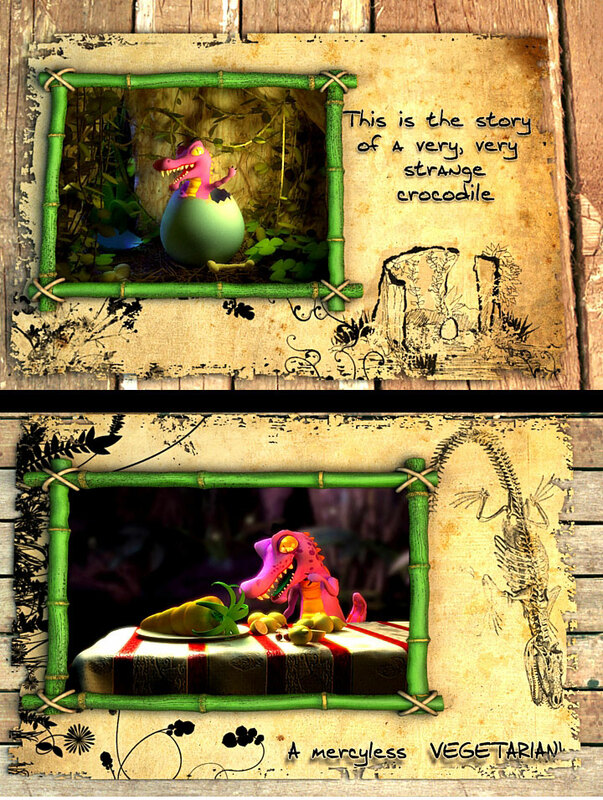 This is the story of Cunga, the dancing pink cocodrile… after his first failures he took another way of life, and after the disapointment of being at the top of the world, makes an insane decition to fulfill his destiny! So finally i finished my entry! there was a lot of work during the last week, but at the end i liked it, i hope you like it too! i have to go and see my GF now, (haven´t been able to see her in a while because of this… haha) anyways, good luck with all your entries!! Congrats on the final animation buddy… u did a nice job… all the best! FANTASTIC… I LOVE THIS WORK… Diferent idea and presentation.